Once exceled in oil and gas but he made his home at Exceed, after financing Exceed’s startup. 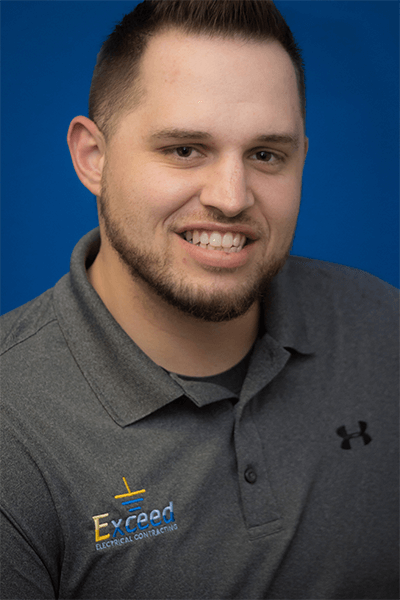 Josh is a graduate from Metro State University with a degree in Business Management and has five years of project management and estimating experience. Josh has started three successful businesses and has been self-employed since 2011. The best seats in a stadium are those in earshot of Josh. He’s an avid Denver sports fan who’s liable to heckle visiting teams. Josh and Ashley Baker are happily married for 2 years with a beautiful 7-year old daughter, Aubrie. The title of “Adam’s First Born” is shared among Scarlett Stockton, Adam and Krista’s adorable daughter, and Exceed Electrical Contracting. Exceed is a byproduct of Adam’s drive, vision, and success. Adam and Krista are expecting their 2nd child in late 2018. 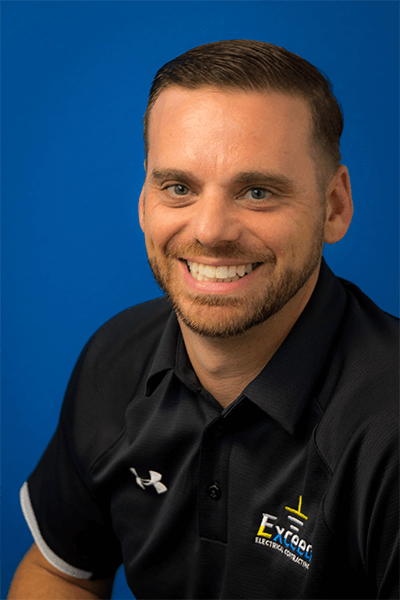 Adam enjoys mountain biking and snowboarding in his free time and was a competitive All-Star swimmer throughout high school. Adam’s career started after high school with an apprenticeship at CORE Electric and later became a Journeyman at Riviera, a Foreman at Axis, and the Special Projects Superintendent at Weifield. Adam’s experience and foresight shaped Exceed to its current form today. Amy grounds the Exceed Shop. 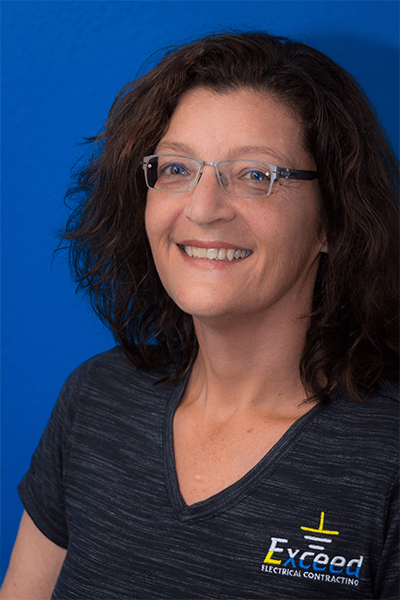 Amy’s 20 years of construction accounting experience and office management capabilities have lit the runway for Exceed’s growth. Amy moved to Denver in 1995 and has raised two wonderful children. Amy is a BBQ Sauce connoisseur, baking enthusiast, and live music fanatic. Amy studied early childhood education in college, her favorite concert of all time was Lollapalooza in ’92, and her favorite board game is Cards Against Humanity. Marty’s supply of time rarely exceeds his demand. Marty started his electrical career renovating kitchen’s in 1998 and has since checked all the boxes to his master’s license and running million-dollar jobs. Marty continues to enjoy the challenges of the industry and is excited to see the industry’s next evolution. Marty’s impressive growth chart is largely due to his better half and his ability to marry up. Marty and Brittny are proud parents of their two youngsters, Cole “The Legend”, and Tessa “Miss Independent”. Marty was born in Germany and grew up in Alaska. The Sivyer’s enjoy many Alaskan (and Coloradoan) things: camping, hunting, snowboarding, and traveling. Steve often wears different Exceed hats. 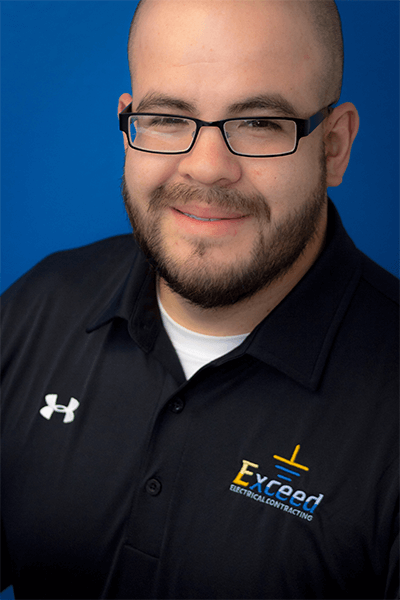 He was Exceed’s first green apprentice and after some field experience, IEC schooling, and company training, Steve moved into the shop as our first full-time estimator. He’s originally from Connecticut and has also lived in Arizona and Texas. He loves the outdoors and traveling; he worked at the Grand Canyon National Park for 3 years. 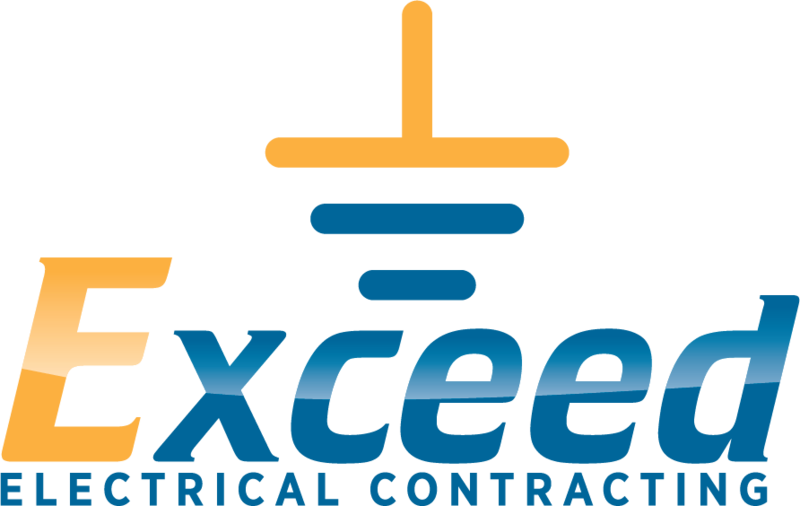 Steve went to school for Business Management and has a strong background in facilities management and sales but found his calling thanks to Exceed. 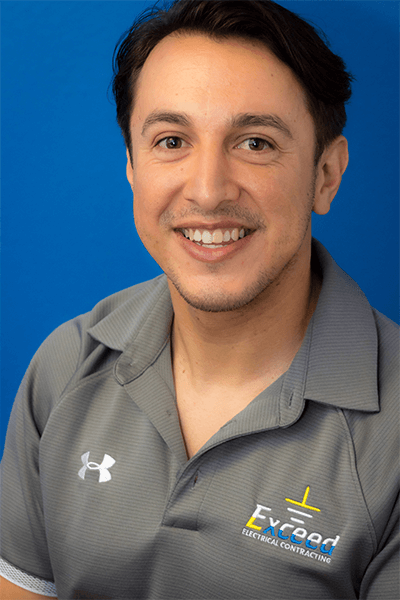 Aaron was living in El Paso, TX when he decided to join the Exceed team. Aaron came across Exceed’s very first job posting, a few e-mails were exchanged, and plans were made for him and his wife Tania to relocate to Denver. 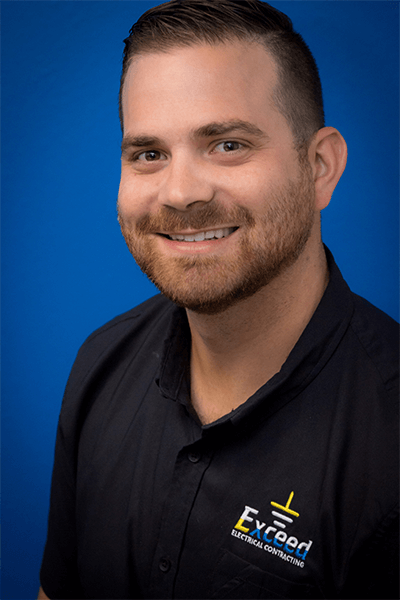 Aaron started his electrical career in 2007 and now holds a Master’s License in Colorado and Texas, and a Journeyman’s License in New Mexico. 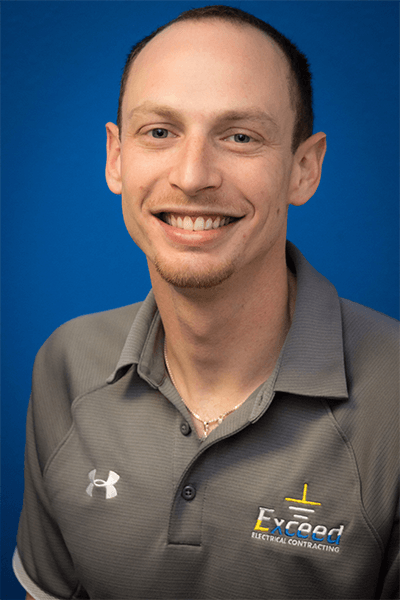 Aaron plays the drums, enjoys fixing up old cars and motorcycles, outdoor sports, and electrical safety protocols. Is on a mission to collect the entire line of Milwaukee Tools. He’s proud of his career as an electrician and enjoys problem solving and mentoring apprentices the most. Dane was born in Ann Arbor, MI but his outdoor lifestyle brought him to Colorado. Dane enjoys traveling, camping, biking, and snowboarding. Dane also loves puppies and long walks on the beach. Dan’s been a Master Electrician since 2005 and brings 26 years of experience to the job site. Dan values team work and drives his team towards quality results, while maintaining a strict construction schedule. Dan raced professional motocross for 13 years and went to college on a football and wrestling scholarship. 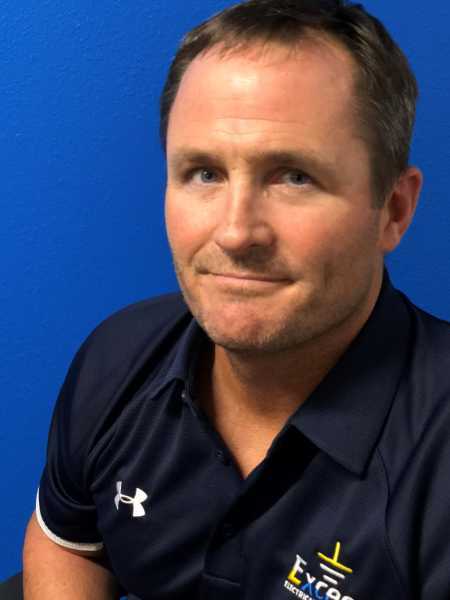 He also enjoys mountain biking, hiking, and camping, but fishing and playing Candy Land with his 6-year-old daughter are his favorite activities. Exceed’s longest standing field supervisor. Delfino brought 12 years of electrical experience to Exceed and helped cultivate our reputation for quality work. Delfino and his wife, Ashley, have been married for 10 years and have two loving daughters, Elianna and Analena. Delfino was born in Guanajuato, Mexico but has spent most of his years here in Denver. Delfino and his family enjoy bike riding, fishing, and watching Netflix.